The Naval Academy’s Class of 2015’s Herndon monument climb will begin at 1:30 p.m., Tuesday, May 22, near the front of the Naval Academy Chapel. The event is free and open to the public. Each year, the roughly 1,000 members of the academy’s plebe (freshman) class form a human pyramid around the 21-foot tall Herndon Monument. 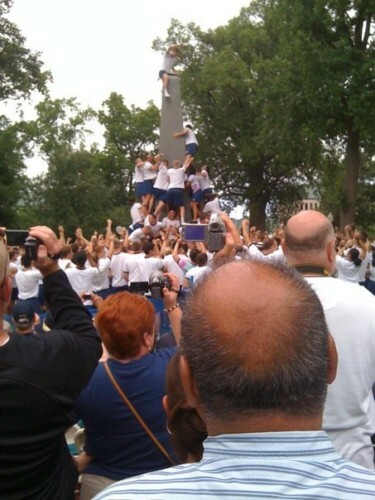 Members of the class try to make it to the top to remove a plebe hat, or “dixie cup,” that upperclassmen have placed on the top of the obelisk. The midshipman then replaces the “dixie cup” with a midshipman’s hat. The event will begin with a recognition of the accomplishments of the Class of 2015 by Naval Academy Superintendent, Vice Adm. Michael H. Miller, U.S. Navy, and will conclude with an award to the Class of 2015 from the superintendent.